FILE - President Donald Trump speaks during a cabinet meeting at the White House, Nov. 1, 2017, with Secretary of State Rex Tillerson looking on. Just minutes after Donald Trump fired Rex Tillerson on Tuesday, the president was blunt about his long-standing differences with his former secretary of state. Trump reportedly had considered firing Tillerson for months. But the decision - and the abrupt way it was executed - represents a dramatic end to a strained relationship. Tillerson learned of his firing by an early-morning Trump tweet, according to Steve Goldstein, undersecretary of state. White House officials disputed that notion, and promptly fired Goldstein. The move left some of Trump's staunchest defenders with mixed feelings. 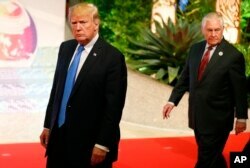 FILE - President Donald Trump, followed by Secretary of State Rex Tillerson, is pictured in Manila, Philippines, site of an ASEAN summit, Nov. 14, 2017. During his 14 months at the State Department, Tillerson had numerous policy differences with Trump - and the friction frequently played out in public. Tillerson also publicly disagreed with Trump’s decision to pull out of the Paris climate accord. He reportedly opposed Trump’s decision to move the U.S. embassy from Tel Aviv to Jerusalem. And Tillerson sometimes took a tougher stance than Trump on Russia — including this week, when he blamed Moscow for a suspected nerve agent attack in Britain. In return, Trump on numerous occasions publicly undermined his top diplomat, including in October when he tweeted Tillerson was “wasting his time” trying to negotiate with North Korean leader Kim Jong Un. 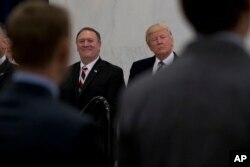 FILE - President Donald Trump and then-CIA Director-designate Mike Pompeo, left, are seen at Central Intelligence Agency headquarters in Langley, Virginia, Jan. 21, 2017. It’s unclear whether Trump’s relationship with the State Department will improve under CIA chief Mike Pompeo, who Trump has selected to succeed Tillerson.